Random happenings, interesting reads, pretty objects and things of interest from the past month. A pile of books awaited me at the library I work in when I returned from my break away. So much inspiration and some gorgeous photos to drool over. Recent good historical novels I have enjoyed are: The Indigo Girl by Natasha Boyd and The Birdman's Wife by Melissa Ashley. Both are based on the real lives of two remarkable women. Tamarillos are ripening - they're a lot smaller than what I can buy from the store, fingers crossed they're still as delicious. Feijoas are falling off the tree quicker than I can consume them now. As my school holiday activity for the library I work in, we made wings. Hundreds of feathers were coloured and decorated by lots of children, parents and staff alike, cut out,and then I had the job of assembling the wings ready for photo opportunities. I think we all did a pretty good job. The Fashion revolution has been taking place the last week or so - some interesting reading and food for thought about excess consumption, buying quality over quantity, knowing who makes your clothes here. Wishing you all a fabulous weekend and week ahead. My family and I went away for a long weekend to our favourite beach. Waipu Cove, about 2.5 hours north of where we live in Auckland. Beautiful expanses of beach, with long stretches of glorious fine white sand. We used to camp here a lot in Summer when Miss B and Mr J were younger, this trip, we stayed in a little kitchen cabin at the camping ground, just metres from the beach. We were very lucky to have good weather, though the breeze was a little cool at times. It was a little bit cold for me to swim, but Miss B and Mr J went in and tried boogie boarding, unfortunately the waves didn't co-operate. We beach walked, and beach combed, explored the rock pools - finding crabs, anenomes, kina and even octopus. Now I'm back home, enjoying another couple of days off before I go back to work. Another successful addition to my wardrobe. This time the Kyoto Sweater from Papercut Patterns. Made from a merino blend that was a dream to sew (especially after my practice attempt with the cotton knit), and is beautiful to wear. I made the XS size, and would maybe add a little extra length to the sleeves when I make it again. Probably the only difficult part was sewing the seams under the arms, there were a few layers and curves to manoeuvre, so I ended up breaking a couple of needles, but that could be down to operator skills (or lack of) when sewing stretch fabrics. I love how it turned out, and I've worn it out in public too, and Miss B and Mr J weren't embarrassed to be seen with me in it, so I think that's a good sign. Now to peruse more patterns,and plan a new wardrobe. Firstly a little bit of news about changes to this fortnightly link up, before we get into the fun show and tell. Linda and I have decided to take turns hosting this link up. Rather than both hosting it on the same day, we are going to alternate, beginning Wednesday 2 May with Linda hosting the first one. This takes some of the pressure off us to continually be creating, and lets us be able focus a little more on family, work and life in general. Who ever hosts the link up will now comment on your link too. 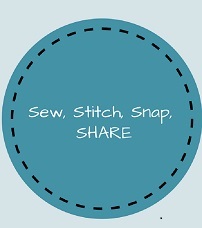 We hope that you will continue to join us both, we love seeing what you have been sewing, and are continually amazed and inspired by the differing styles and talents you all have. So what have I been up to over the past two weeks. We've had a cold wintry blast arrive, so I have been enjoying sitting under the sea glass sampler quilt, stitching away - this time a kantha inspired panel. I'm not sure whether I like it, maybe my stitches are too big, or I need some more rows in the gaps. I keep looking at kantha quilts for inspiration. However, I think this quilt will have an amazing texture to it, when it is finally finished. Yes more blocks for my Solstice Dream Wall hanging - I've only 1 x 6.5" block and 1 x 12.5" block to go before I can piece them together - then it's onto the borders. Clothing sewing - this was a test run of the Kyoto tee, I haven't hemmed the sleeves or bottom of it, but I now know the size is correct for me, and I polished up my frill making, attaching and neckband skills before I attempt the good version. Thanks for joining us, and we look forward to seeing you all link up at Kokaquilts next fortnight. Way back in January, I started Block 5 - Marsh, of my Solstice Dream Project, stitching a dear little frog , which was created from bullion knots, leaping off a lily pad. Then I stopped. Why? Because I was too scared to stitch the dragon fly wings on, they are made of organza ribbon and I thought they'd fray and tear and cause all sorts of grief. Over the past few days I have finally finished the block, if anything the wings were the least of my worries, all those french knots on the dragonfly head were cut off and restarted at least three times until I was happy with the end result. Now it's onto another block, this time I'm redoing one of my beautiful blocks that I made too small. With my recent foray back into sewing clothing,, I have splurged and bought another pattern from an online indie pattern designer, and some more knit fabrics. Oh what a slippery slope to a rabbit hole full of piles of unfinished clothes and unused patterns I could fall into. I read recently on a sewists blog some advice which I though very prudent ..." only buy patterns of which you would actually buy the garments if they were ready made"
My latest pattern purchase is the Kyoto Tee, designed by PaperCut patterns, a New Zealand based company. The Kyoto tee is a softly draping t-shirt with a frill on the drop shoulder, smart yet feminine, and I think it could be layered successfully over long sleeve tees in winter too. I also like the long sleeve sweater version. I ordered the paper pattern, so I don't have to faff around printing it off and then assembling it. Currently, I am making a test version, in a cheap cotton knit before I cut into this beautiful Merino Jersey from The Fabric Store. So far the instructions are really clear and it's quite a simple top, if little fiddly with the frill, to assemble. I'm not terrible happy with my top stitching around the neck, and am debating unpicking it, if I can see the stitches well enough. I've discovered stitches really seem to sink into knit fabrics, and my eyes don't seem to like trying to find them. I'm calling it quits for the day now, hopefully I'll finish it up tomorrow. Inspired by my recent success with making the Anegada Boatneck Top, I have been garment sewing again. This time it's the Ogden Cami by True Bias. This is a pattern I have have seen made a lot online and of which I have read wonderful reviews. The pattern is available by PDF download only. I figured I'd use this fabric as my muslin, then if I liked the fit, I'd make some up in nice colours ready for the following summer. After measuring myself carefully ( I was size 4), assembling and cutting out the pattern with a little help from Meeka, I was ready to sew. The instructions are really clear with lots of diagrams, and it's not really a hard pattern to make. Mine fits okay, but I think I need a less padded smoother strapless bra to wear underneath it, it feels a a little tight around the bust, (something I never thought I'd be saying that about any clothing) and seems to catch on the top of the bra and under the arm, causing some wrinkling. I'd possibly also consider lengthening the lining so it sits below the bust line a little lower too. It's still a comfortable top, and I will try making it again for summer, possibly making it into a longer chemise length for sleepwear.